If you are following the Transformers: "Seeds of Deception" comics, they you probably know that the main goal of Magnificent Crisis was to bring back Rodimus Prime. The real, Matrix-invested Rodimus Prime. Not just a glorified Hot Rod whose name got changed into Rodimus. The G1 character: the tormented Autobot Leader who had a vision and aachieved results like no one before him. Well, continuity-wise speaking, the character born at the end of "Magnificent Saga" is not the G1 character, and his appearance is different as well. But it's Rodimus Prime in all that matters. And what is, exactly, that which defines Rodimus Prime as an accomplished adult, a mature leader, a sophisticated thinker? 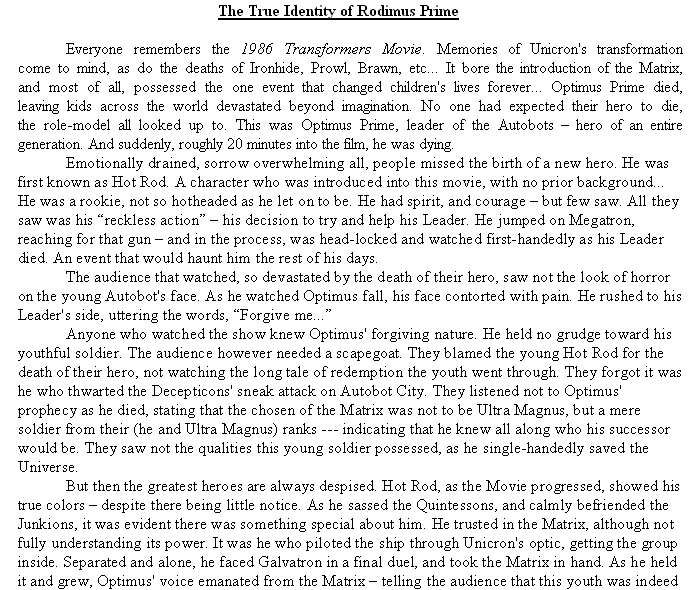 You might want to find out through this essay about the character who first appeared in Transformers: The Movie (1986) and then made his way through the whole Season 3 of the "Generation One" cartoon: it's all there, and it's also all that went into defining the "updated" version of "Seeds Of Deception" (which would not exist, without Simon Furman creating this new universe). Wow. You must really like Rodimus Prime. Never knew anybody liked him this much. Cool. Yup. Checked it out. Always was fascinated by the magnificence. I read the whole thing and I must say, you made a very deep, detailed, and true as f*** observation through and through. And you know what? I agree. "And when the going got tough, he didn't just sit back and watch" No he just let Ultra Magnus pick up his slack. "He went out on the front lines, and took care of business." When the plot decided to have him do something instead of Magnus or Springer. Everybody liked Rodimus eh? Maybe because they saw the autobots beat Unicron and thought that every other problem was minor compared to something like that, maybe they were grateful to him for that, maybe they feared the autobots because they killed a planet sized robot so they better try to atleast listen to them so that they won't destroy their planet or maybe lazy writing (witch is more realistic) YOU MAKE THE CALL. Some times Rodimus didn't care about his duties, and Magnus had to do his job. When Springer was torn to pieces in Five faces of darkness, his reaction to his friend maybe dying was "Ew gross". 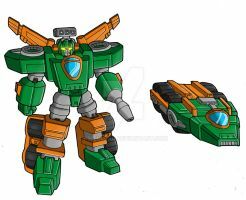 When Sandstorms planet was destroyed he said "Who cares Cybertron is better anyway". "He dwelt in a constant state of sorrow, lived an unending existence of despair. He longed for relief from his duties, but knew all depended upon him"I remember only a hand full of times he was sad or doubting himself, and again most of the time Magnus or any other autobot or a human would pick up the slack for him. He made necessary sacrifices? Oh yeah he um... blew up a planet um... Endangered his friends from time to time... OH and because of him he Springer, Arcee and Magnus turned into humans yeah good times. Yeah Optimus was never forced to make sacrifices, like that time Megatron in season 1 brought Cybertron to earth in order to save it, when he had to blast Kremzeek, abandon Elita-one and Alpha trion. Yeah being depressed and unsatisfied while watching season 3 was great, especially the ones that had weaker writing then the worst season 2 episodes. Rodimus replies wryly, “Well, you'll pretty much have two choices. Suffocate, or smother...” Because that is what you should tell a kid, 2 horrible ways that he die from points for honesty i guess? Oh yeah he leaded in tougher times, even dough he had almost full support from the entire galaxy, non of his friends died and nobody objected his orders. I weep for him. Yes he is inferior to Optimus, but he should not compare himself to him, in fact he should try to be the best he is as himself. "On a similar note, Rodimus is the only one to ever actually lament the war" Did you watch the first two seasons? "All the same, that does not excuse the fact that it ruined a chance to continue on a path that could have ultimately become greater than any taken before or since." Yeah because bringing back an old character would ruin everythig... somehow? 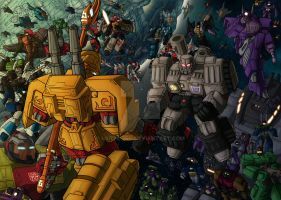 "In the two-parter, The Return of Optimus Prime, Rodimus in his final moments creates two memorable scenes. One is his debut in the episode, him looking upon a giant gold statue, lamenting the fact that he could not be his hero" I will admit that moment made me relate to him and feel sorry for him, so yeah probably the best Rodimus moment of the season. "Optimus, although great in his own right, suffers from the delusion that everyone is innocent" While you can see that as a problem i see it as a positive, like Batman he believes that anyone can be saved and that there might be good in everyone (plus he never really said that, especially for Megatron). 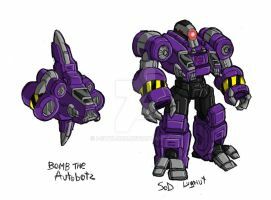 I mean look at Blitzwing in the pilot, he became a good guy for a while. Are you really going to tell me that what Optimus believes isn't at least a little bit true? HE was the one who saw reality clearly? Oh yeah the guy who did not take many things unless Magnus told him to, you said it yourself when he was cracking jokes about his mantle. Oh yeah in the first 2 seasons it was all sunshine and rainbows in every episode. Again Optimus did not say that everything is good and that everything could be resolved in the end of an episode, that is just unrealistic (if you were talking about 1987 tmnt, then yeah you got a point). I admit he did hesitate in the movie, but he was ready to end Megatron in the end. I remember him blaming himself only once in season 3, never in the movie. Oh come on the return of O. P. was a tragedy and all that is just to much man, there are many franchises did something like this and made it better, made the massage better and the narrative better so don't give me that. Yes i admit it was a cop-out, but not all cop-outs are enherantly bad. As a comicbook reader i have seen my share of terrible cop-outs and this is not one of them. Heck we saw worse in the same exact franchise. No, most of us didn't except him because he was poorly written, and shoved down our throats out of nowhere. I would not mention Head masters if i were you, in the show he just left the autobots with the majority of the season 3 cast, and let Fort Max to lead the autobots(not responsibly might i add). Yeah again Optimus never struggled, didn't sacrifice or had hardships himself. In conclusion while i see where you are coming from, and you do have some strong points about Rodimus i just can not agree that he was what the series needed. His personality clashed with his mantle, his comrades were doing most of his work for him and i just can't forgive him. If it happened in the real world you bet that he would face the consequence of his actions. Atleast Kup or Magnus could have told him that he did the wrong thing and that he should learn from his mistake, that way he would feel guilty and realize the reality of the situation. In the movie i didn't feel his regret nor did i feel that he was fit to be a leader. If it was someone from the old cast that became the new Prime, sure that would have had some weight not this new guy we just met out of the blue (same goes for the rest of the new cast). Overall i see what you are trying to say, but there is not enough evidence in the writing of the character to prove 100% what you are saying. P. S. Yeah it is not that far fetched that they stupidly bought back Optimus from the dead .I mean in the show he had worse things done to him, and in the movie we saw what happened to Ultra Magnus and he is better now. I think the didn't have enough spare parts at the time to revive him in time, so that is why he died. Better explanation i can't think of, except plot convenience. Sorry for the wall of text. Don't forget how he use the bomb to scracth his his ear. Ultra Magnus after seeing Rodimus Prime using the bomb as an ear scratcher. Good points all around, thanks for understanding. You're welcome. Also thank for understanding and for calling it out in respectful way. You could've been rude to the writer, but you didn't. Good job. You didn't overlook Rodimus terrible mistakes like the writer did. I think that they overlooked the many mistakes that Rodimus made because sometime love blinds us. We sometimes overlook the mistakes the ones we love did, of course you can love someone or a characte and not look past their mistakes. I hate how they make him look older. It makes us ( maybe only me) think that he's been ruling for years. (OT) Anyway, long story short, Rodimus can be a good leader, but during g1; it was kinda too early for him. He needs time first and then comes leadership. No one is innocent and it's kinda true. Everyone has some bad in them, however they can also have some good in them. It seem to me that both Primes are correct. The world is more shades of gray then black and white. Anyway, I'm not for sure that it was a good idea to use Rodimus "no one is innocent as a good example. Rodimus Prime was being control by the hate plauge, so we or they don't if he said "no one is innocent" willfully or not. I find s3 Rodimus different from movie Rodimus. The movie Rodimus never shown that he was heartless ( and was much cooler ). He didn't say ew when saw Kup being legless and armless. Movie Rodimus never seem to be heartless. He would probably shake his head at s3 Roddy. He probably never became Prime if he could see in the furture. Ps. I find it quite funny when he said you'll either smother or suffocate. Idk why, but I find that funny. Okay he was a bit harsh when said that, but it's much better then sugar coating it. In oposition to the US-comicverse I see Rodimus Prime (more) like he was characterized in the UK-comicbooks: a somewhat broken (tragic) hero/leader. Not only the killer of Optimus Prime. Damn! I like this. This was a good analysis and very very true. Hopefully you won't get crap for this. I never understood the Hot Rod hate to begin with. I never knew about it until I re-entered the fandom in 2011.
but time and wind have worn them down. let it take me apart. but nothing is anything special. predictions' wail will wind up high. I am a transformer, look past my titanium plating. ...was supposed to be a prompt 'hate' but it got...really touchyfeely and schmooooooooopy. That, uh, may be a warning. Damn. "Hate is a useless emotion," Wing murmured, stroking his hands over Drift's shoulders. Drift twitched, but didn'tentirely--pull away. Learning, Wing thought. Not all touches are hostile..
"How do you stand it?" Drift forced his shoulders to loosen under the gentle touches of Wing's sensitive hands. "Trapped underground, like creatures fit for sewers." He remembered the sewers all too well. "It's not so bad," Wing said, his voice reasonable. "We have our entertainments." "You don't seem quite like the type." Of course Drift was thinking of the bawdy entertainments he'd seen in the lower zones, or on leave. Desperate mechs, willing to do anything for some credits. Or attention. Or worse.